Requires 12x12 cutting mat. 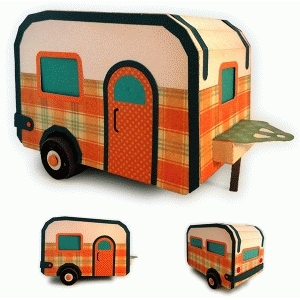 Caravan capers await with this realistic dimensional travel trailer box composed of lid shell (windows, doors, bumper, hitch) and base box (wheel support and square axel, and wheels). Base box color shows through as "interior" through window openings. Details include two-tone side panels, window and door frames, top vent window, hitch support, tires and whitewalls, bumper, and more. Measures approx. 4.125" wide x 6.5" long (plus hitch) x 4.75" tall. View an assembly tutorial at http://needlesnknowledge.blogspot.com/2015/07/camper-3d-trailer-model-assembly-guide.html. A SnapDragon Snippets design.